Leslee's Creative Inspiration: Simply Awesome! That's what these cards are...simply awesome! These were done for this week's CAS challenge on SCS. You can see the challenge HERE. It was more of a sketch challenge this week. The original layout was done on a square card, but as I've said in earlier posts, I don't do too many odd sized cards. These are standard A2 cards. Pretty much any layout can be altered to fit any size card or scrap page that you desire. These cards took all of 10 minutes to make. Literally! I started with a piece of Whisper White card stock (cut to 4-1/4" x 3"). 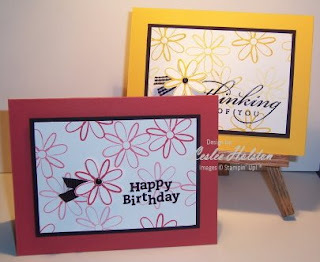 I chose the lined image flower from Little Layers Plus (I still had it out on my desk from a previous card). I inked it once and stamped it three times. This is called generation stamping. Each stamp is a little lighter than the last. I then stamped the sentiment in Basic Black Craft ink and embossed it with black embossing powder. I like the way the embossing makes the sentiment stand out amongst the images. I stamped one image on scrap paper and cut it out, placed a black brad in the center, a snippet of ribbon and popped it up on a Stampin' Dimensional. The fact that it has the brad and is popped makes it stand out amongst all other images. I layered the white panel on Basic Black cut 1/4" larger than the white. Then mounted it all, again with dimensionals, onto the base card which is the same color as the stamped image (in this case, Summer Sun & Ruby Red). I so loved this quick and easy layout, I simply couldn't stop there! 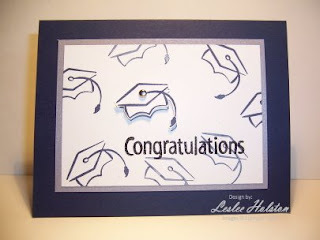 I did this graduation card too! It's in Night of Navy, with a Brushed Silver layer. This would be GREAT for mass production! And, ohh, the possiblities are endless! Quick Note: Don't over stamp your image. Too many images on the small layer makes your sentiment and popped image disappear. In this case, less is more. Thanks for checking in today. I'm so glad you did. Leave a comment and let me know what you think. I hope you'll give this layout a try. It's super fun!! !